The Astronomik UHC-E filter is our budget filter for deep-sky observation of emission nebulae and comets under light polluted skies. It's particularly suitable for small 'scopes. The UHC-E Filter increases contrast of emission nebulae and comets and blocks the light of typical streetlights as well as airglow. It is best suited for telescopes up to 5" / 125mm. The Astronomik UHC-E filter provides a FWHM of 45nm and blocks the light of typical streetlights (e.g. sodium and mercury vapour) as well as airglow. Thus it increases contrast between your target and the night sky. The contrast enhancement is less than that of the Astronomik UHC filter, but at the same time the transmitted amount of starlight is greater. It's therefore better suited to smaller telescopes. As the UHC-E filter passes a spectral line of Carbon (due to the higher FWHM) it opens up the possibility of comet observation. Easier resolution of Double Stars. Photography under light-polluted skies with DSLRs and other cameras. 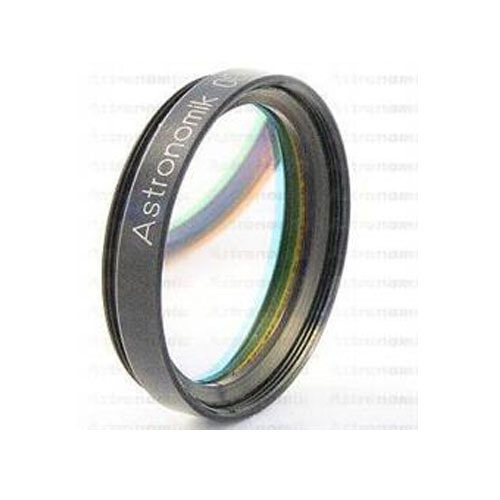 If you use a telescope with an aperture larger than 5", we suggest the use of our standard UHC-filter because of its greater contrast enhancement capabilities. If you use a telescope larger than 8", you can try our OIII filter for even better results when observing specific nebulae.